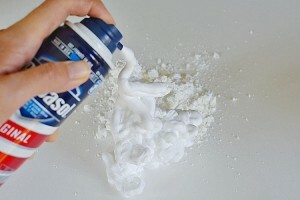 Mix together equal parts shaving cream and corn starch. (Don't worry about measuring exactly). Knead it together until it starts to form dough. Add more corn starch if it's too sticky. Add more shaving cream if it's too dry.